We live in a time immensely affected by numerous wars and conflicts - notably the ongoing conflict in Syria, where the situation has significantly worsened in recent years. War and conflict have forced millions of people to flee across borders in search of safety and security. The majority stay in neighboring countries, but for those seeking protection in Europe, the ways to legally reach the EU are very limited. As a result, many people risk their lives crossing the Mediterranean with the help of human smugglers - often, with tragic consequences. Humanitarian visas are one of the tools that EU Member States can use to ensure that people in need can legally access international protection in Europe. These visas can be a quick way to resolve some situations, especially when individuals are in urgent need of care, or when prolonged asylum procedures are getting in the way of family reunification. Increasing the use of humanitarian visas in the EU would also contribute to preventing the dangerous, and sometimes deadly, attempts to reach Europe by sea. Regrettably, humanitarian visas are currently underused, despite the large numbers of people in need of protection. The absence of a specific enough definition of humanitarian visas, coupled with the lack of clarity around how to process and issue them, mean that EU governments have only been granting a very small number of them in recent years. Navigating the administrative procedures involved in accessing a humanitarian visa can also be very challenging for the applicant. 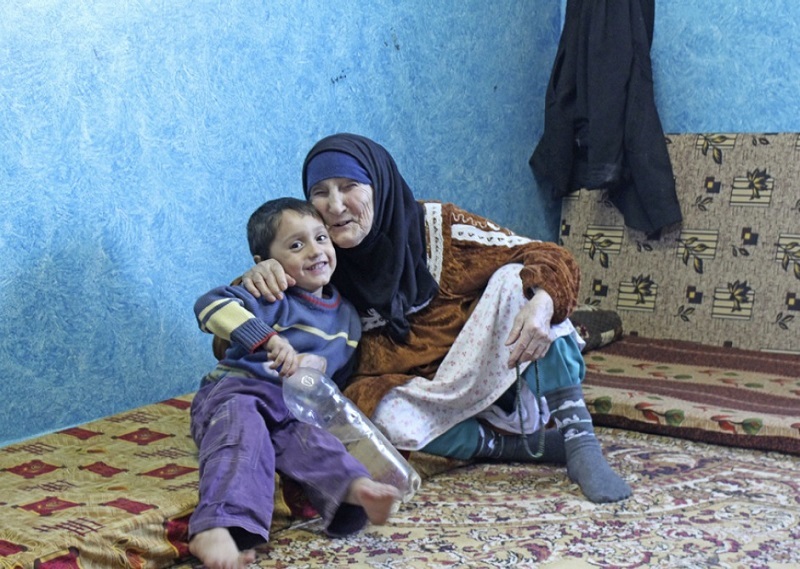 In September 2013, the Swiss Red Cross launched a programme to provide active support to Syrian nationals making a request for their relatives to be allowed to enter Switzerland legally using humanitarian visas. Applicants are provided with various services, such as information and advice, help with administrative procedures, and in some cases, assistance with organising and financing flights. Thanks to these services, the Swiss Red Cross helps ensure humanitarian visas are made available to individuals and families facing difficult situations. For example, Mathu* arrived in Switzerland to seek protection in 2015, while his wife and 4-year-old daughter were still in Syria. The family is part of a Christian minority group which is at risk of being attacked or kidnapped by radical Islamist groups that are present in the country. Mathu was therefore extremely distressed and desperately trying to get his family to safety as soon as possible. He made requests for humanitarian visas several times, but was repeatedly rejected until the Swiss Red Cross got involved. By collecting information and documents about the family’s situation, the Red Cross managed to draw the authorities’ attention to this particular case. Consequently, humanitarian visas were finally granted and the family was reunited in Switzerland. Building on this and similar experiences, the Red Cross published a report containing recommendations to the Swiss authorities on issuing humanitarian visas. It advocates increased legal access to international protection by making more use of humanitarian visas. In addition, the Swiss Red Cross underlines that decisions on granting humanitarian visas must be considered on a case-by-case basis. Assessments should take account of the concrete individual factors of each specific application, in the light of a multitude of aspects that impact vulnerability. Furthermore, clear criteria should be defined and made public so that applications can be handled faster and more transparently. Visit the Swiss Red Cross website for more information (in German and French). Download the Swiss Red Cross’ report on their support to Syrian nationals applying for humanitarian visas to enter Switzerland. On 7 March 2017, the Court of Justice of the EU stated that Member States are not obliged to admit people on humanitarian grounds. The case, X and X vs. the Belgian State, was presented on behalf of a Syrian family of four who had filed a request for a humanitarian visa at the Belgian embassy in Beirut, Lebanon. 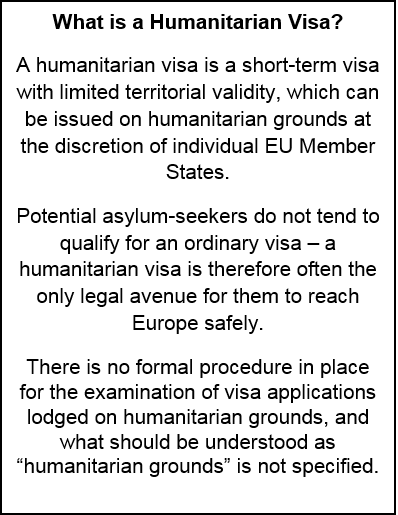 The Court was asked to asses whether and under which circumstances EU Member States are obliged to issue visas on humanitarian grounds under the EU Visa Code. Regrettably, despite the recommendations of the Advocate General, Paolo Mengozzi, the Court left responsibility for granting humanitarian visas with Member States, which in practice could serve to minimise the use of these visas as a safe and legal avenue to accessing protection in the EU. Read our joint statement on humanitarian visas at the EU level: NGOs call upon EU institutions and member states to expand the use of safe and legal channels for refugees. *“Mathu’s” name has been changed by the author to protect his identity.